Proposed to NSE already earlier to have a Practical Three to Six Months Fundamental Equity Certification Course conceptualised and conducted by me on weekends to translate Theory to Application & Academics to Action…This Proposed Course should considerably enhance the practical knowledge & therefore confidence & conviction levels of those taking it by leading to their increased marketability to potential employers & clients and even better proprietary performance. This then sadly was not a real disnvestment just as it was not for a similar 10% last year too when Oil India & ONGC were ordered to pick up 5% each at Rs 220 .,,,just another continuing story of government selling from one PSU to another ! Its no wonder LIC does not want to go public ! and neither is the Government inclined to make it public ! It’s happening for decades now….UTI was first the Big Market Daddy in the 1970’s to 1990’s before India opened out to FIIs and Other Mutual Funds that saw UTI losing it’s war of words with SEBI to be brought under it’s regulations….in the late 1980’s the UTI Chairman then had opened out to me in a candid interview on UTI’s Investment & Disinvestment Decisions Process,sometimes buying a company’s shares through one broker and selling the same company’s share on the same day through another !, and Competition emerging from other Mutual Funds sponsored by PSU Banks that were allowed to be set up .It was to be carried in a leading Magazine…it was explosive and so I send him the transcript to confirm he was not being misquoted….Phew! he panicked and asked me not to carry the Interview….had told him it would be the Editor’s call….it was not carried finally ! Who’s to Question LIC !…or for that matter the Government ?…and the Disinvestment Secretary boasts of how with this Disinvestment it’s a been the best first half of the year in the last many years for Disinvestment Proceeds ! It’s the Cash Cow for the Government to lead and order the flow wherever it conveniently wants Investments ! Typical ~ Equity Investors are piling on at these Highs ~ they need to be cautious ~ especially those who are returning or initiating fresh exposure now not having done so in 2013 or earlier in 2014 ~ advisable to await the post budget scenario as there is a high probability that once euphoria abates the Sensex and Bellwether Scrips may correct 10% or more…the real danger though are the small caps and midcaps that have run up crazy,some over 100% in months…they may correct 25% to 50%…yes that high ! Financial Technologies @ Rs 144 ~ A Story of Guts and Glory now Guttered ! I don’t own any shares of the FTIL Group but I do have some very good friends and associates who work for it and are extremely wise and forward thinking and manage the FTKMC admirably and who graciously invited me for the MCX Equity Exchange Launch at Hotel Trident where our FM,Mr Chidambaram in his inaugural speech lamented Insider Trading and Speculation but amusingly went on to sound the gong for the Exchange’s first and symbolic Future trade ! Media has justifiably gone to town on the NSEL and FTIL Group Plight ~Realms can be written on this and am sure a Best Seller Book too will finally be published to reveal what went wrong ! and was it a deliberate sinster plan right at the outset ! ~ and what is the extent of Political patronage at the highest level that’s keeping the Group alive and kicking till now ! For Now this is all that I’m going to say……. However today the Share Price intraday dropped over 10% to Rs 140 levels as yesterday on the eve of the AGM the Auditors Deloitte Haskins & Sells has announced that their report of May 30,2013 on the standalone and consolidated results of FTIL results as on March 31,2013 should no longer be relied on ! Remember the Satyam fiasco and how the Auditors Pricewater House had released a similar note warning that the last 39 quarters of their audited results should not be relied on ! ~ this went all the way back from 2009 to 2001 ! FTIL’s EPS for FY 13 was Rs 70 ~ It’s June Q 1 FY 14 shows Rs 17 ~ but Deloitte now tells us not to rely on their report ! Posted in ADAG Companies, Bulk Deals, Controversies, Corporate Governance, Financial & Stock Exchanges, Information Technology, Insider Trading, Interesting News Sightings, INVESTOR MISTAKES, Mutual Funds, Reflections, Satyam : The Sordid Asatyam Saga, SEBI, Sectors, STOCKS, VALUATION	Tagged Financial Technologies @ Rs 144 ~ A Story of Guts and Glory now Guttered ! Several years ago the Emkay Promoters had sought a meeting with me as one of their Broking Clients and my Advisory one had made a 600% + gains on his Portfolio inside a year and they wanted to meet with the guy whose advice did this ! ~ they had only recently set up a Research Team taking several analysts from a leading stock market media house and they wanted to tie up with me ~ did not work out as I must have quoted too high I suppose ! …and it’s sad luck that Emkay did this deal on NSE and not BSE for BSE may just have helped them out given it’s past track record for doing so when during Broker Dominated Boards, EDs and Presidents have had to resign for malpractices ~ like opening the Exchange in the middle of the night to insert trades ! or else some brokers would have gone bankrupt on their positions ! 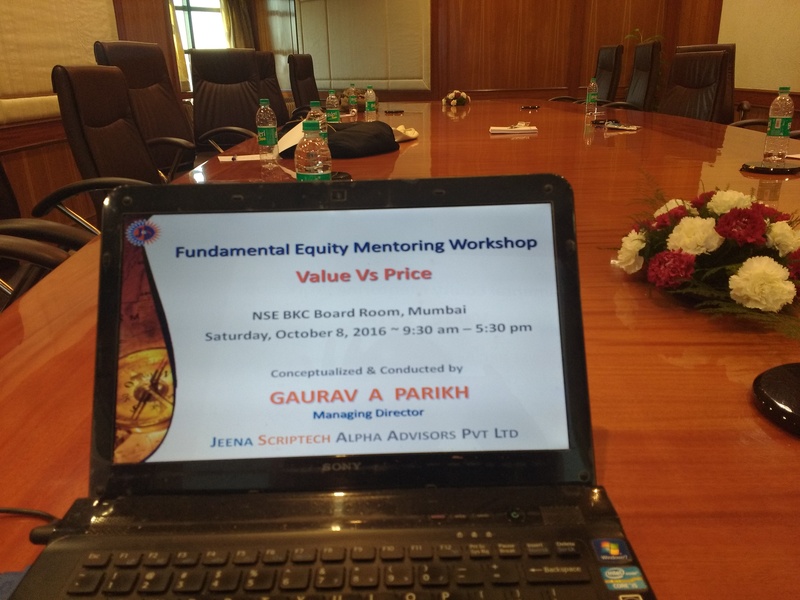 Getting Requests from all over India for Fundamental Training in Equity Portfolio Structuring and Stock Selection…need your support to make it happen soon ! If you can muster up at least 15 interested people your town or city to attend the workshop ,we shall have it arranged immediately at a good venue in your city ~ you can guide us too for this and even be our local coordinator ~ of course you will be compensated with free participation and a coordinating Fee too ! Those who interact well in the workshop will be pleasantly surprised with Interesting Prizes ! Posted in Derivatives Strategies, Economy, Foreign Institutional Investors, Global Economic Crisis, Gold and Silver, Insider Trading, Inspiring and Motivating, Investing Approaches, Investing Themes, Investor Gurus, INVESTOR MISTAKES, IPOs, Mutual Funds, My Speaking Engagements, Nifty, Reflections, Sectors, Seminars & Workshops, Sensex, STOCKS, VALUATION	Tagged Getting Requests from all over India for Fundamental Training in Equity Portfolio Structuring and Stock Selection...need your support to make it happen soon !